First, design a room of your dreams. You can choose from six different room types (for example, bedroom or kitchen) and two styles (modern or classic). Once your room is loaded, think of it as your canvas! You can choose from a selection of flooring, repaint walls and ceiling, refinish cabinets, furniture, countertops, or anything else in the room! 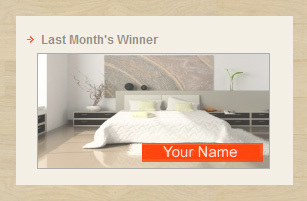 When you are done, click on the "Save Design" button and fill out a simple registration form to enter the contest. If you’ve previously registered, you may login with your e-mail and password. As soon as you submit your design, it will be available for voting! Once you submitted your own design to the contest, it is now a good time to vote for other designs! Click on the “Vote” tab to vote for other peoples’ designs. When you see a design you like, click on “Yes, I Like it”, when you don’t like a design, click on “No, I Don’t”. As soon as you cast your vote, another design will be shown for your vote and so forth. You can vote for each design once. The design that gets the most votes at the end of each month wins a $500 gift card. You may login at any time to view how many votes your design has received. Designs that don’t win automatically get entered in the next month’s contest.